Meme-morial Day! 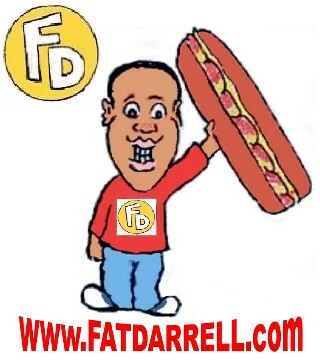 – #DoubleFML FatDarrellPalooza! Hey everybody, welcome back to #DoubleFML! I hope that you all enjoyed your Memorial Day weekend and aren’t “struggle bussing” it too much at work today. I don’t know why but the work week always feels twice as long after a 3 day weekend for some reason. Hopefully none of you are stuck on the highway or inside of an airport reading this right now. Did you know that Memorial Day weekend is one of the busiest travel times of the year? If not, now you know – so if you win on “Who Wants to be a Millionaire” or something, you at least owe me dinner or something. Obviously Thanksgiving is still the busiest travel weekend but MDW is right up there since it’s the unofficial kickoff to summer. Wow, I suppose I’d better break out those white jeans before it’s too late lol Labor Day is just around the corner! So what did you all do to celebrate? I personally ate so much this past weekend that I’ll be doing “punishment workouts” all week to make up for my gluttony! Hopefully you all had just as great of a time at the beach or at your barbeques but let’s not forget what Memorial Day is truly about. With that said, thank you to all of the brave men and women who paid the ultimate sacrifice protecting our nation. We salute you and your families for your strength, courage and honor. And no, before the grammar police flag me down for the spelling error in the title, that was actually done on purpose! This is not to be confused with an emoji which is “a small digital image or icon used to express an idea, emotion, etc., in electronic communication (You tell ’em again wiki! ).” You know, like this 😊 or this 😉? Sadly enough, I’ve had entire conversations where no actual words were exchanged, it was all memes and emojis. Our ancestors must be so proud of the progress we’ve made as a society! We’re basically cavemen and women…but with wifi. Who knew that smartphones would make us so dumb? Hmm, I think that my most often used emojis are the flexing arm and the crying laugh which represent 2 of the 4 main themes of this blog (Fitness and Laughs) so hey, it looks like I did a pretty good job naming this thing eh? What are your most used emojis? Comment below! Well, unless it’s the eggplant, ya nasties…. Anyway, since we’re nearing the end of the month, I thought that I’d share some of the best memes and web content that people have sent me over the past 4 weeks. A few of these are oldies but goodies yet still hilarious! Okay, so without further ado, let’s get to it shall we? So keeping with the Memorial Day Theme, check these out! If you read my review of the Swedish Fish Oreos (if not, check it out here) you’ll understand why I’m a little reluctant to try these! If anyone else has though, I’d love a review! Based on the photo, the icing appears to be the traditional flavor we all know and love but I don’t know about those pop rocks on there. Hmm… I’ll see if my grocery store has these so that I can possibly give you a review but if someone else wants to provide a report instead I have absolutely no problem with that! Man, isn’t this one the truth! Hopefully things are back to normal now but it legitimately got cold out there again for a week or 2! Every time I think that I can pack up my hoodies for good, BAM it gets cold again! Chill out Mother Nature, you’re drunk! I literally carry that “Get of Jail Free” card in my wallet. If it ever came down to pulling it out, I’m hoping that the cop either has a great sense of humor or it plays out like the comic strip on the left! As I mentioned in this post from a few weeks ago though, I’m seriously impressed with how quickly they fixed that! These next 2 cracked me up as well. I must not be human or something because those automatic sinks and paper towel dispensers never seem to recognize me. I always end up having to go back and forth to different ones, giving up and wiping my hands on my pants or doing an interpretive dance complete with “jazz hands” to finally get it to work. Although automatic toilets seem to work WAY too well for me. If I even come within 5 feet of one or blink at it, it starts flushing like crazy. I seriously don’t get it. My friend LJ sent me this photo of the TriceraTaco but now LJ needs to actually send me a TriceraTaco! How cool is that thing? Ha…although, who makes just one taco? I’d end up needing at least a dozen of those things. My dinner table will look like a scene from Jurassic Park or something. Ha aww, poor T-rex’s…that picture is cute too and what more can I say about the crying and eating tacos meme? I mean, how can you be sad with a mouth full of tacos? Impossible! Haha this one is hilarious too. Hey, I’m short so I’ll be honest, lol I’ve been there! One time, there was this gorgeous woman in the grocery store that I kept passing every aisle. We made eye contact a few times so I tried my best to play it cool. Anyway, we passed each other in the toilet paper aisle and the brand that I wanted was on sale so it was sold out on the floor level but there were a ton of them way up on the top shelf. I clearly couldn’t reach them…even on my “tippy toes” lol but I couldn’t let her see me climb for it. So I did my cool “sup?” head nod and stalled around until she walked to the next row. Anyway, halfway through my scaling of “Mount Charmin” she came running back into the aisle because she had forgotten something. We made eye contact and I had no idea how to play this off now. I mean, I was standing on the shelves AND I was reaching for toilet paper. It couldn’t get much worse than that! Oh wait, this is me we’re talking about so actually, it did! Since I was already committed, I grabbed the toilet paper that I wanted and tossed it toward my shopping cart. Of course I missed so it bounced off of the side of the cart causing it to slam into the other side of the aisle and make a loud noise. She rushed over to pick my giant pack of toilet paper off the floor for me which made me even more mortified so I hopped down quickly to try and get it myself. If nothing else, maybe I could at least do a cool landing or something to regain an ounce of dignity. But nope lol when I hopped down I landed on the bottom shelf which collapsed and took 2 neighboring shelves full of product down with it! Or at least one reason – because you know that i’d totally wear these pants right?! The meme on the right is a good reminder that maybe I shouldn’t actually wear them though! I mean, if I want to be a scary ghost for example, it’ll be hard to frighten people wearing peperoni pj’s… unless I’m haunting a vegan who’s allergic to gluten. As for the picture on the left, who knew that the Grim Reaper was A) a woman and B) such a fashionista?! Get it girl…. I am definitely the type on the right! It teaches my car discipline. I like to let it know who’s the boss every now and then, ya know? Ha, I’ve had a few close calls but I’ve only completely run out of gas one time. It was embarrassing, but not “climbing for toilet paper in front of a supermodel” embarrassing.. This one goes out to all of the ladies out there with RBF. If you’ve never heard of RBF, it stands for “Resting B-TCH Face” and it’s a real thing! Haha, my friend Chelsea posted this one since people are always telling her to smile because she looks angry even when she’s in a great mood! I’ve been told that I have the male equivalent RDF or “Resting D-CK Face” when I’m working out at the gym sometimes too! But in my defense, you don’t smile while holding a few hundred pounds over your face! No arguments here, women are DEFINITELY stronger than men when it comes to toughing out an illness! Every Day. The worse is waking up with less than a minute to go before the alarm is set to go off. You can’t even adjust to being fully awake before you’re suddenly in a race to turn it off in time. From sound asleep to heart palpitations – good times. Here are a few mental and physical fitness memes that were also sent my way over the past 4 weeks. There are a few grammatical errors that irk me (ex: You’re instead of your – hey don’t blame me! I didn’t make that one…) but the concept is still great so I’m sharing it anyway! And from the “Don’t try this at home” side of things, check these out! I can definitely relate to that 10pm meme! And finally, this last one really made me think. I mean, in my case, most of the words would probably end up being food, but beyond that, how pretty would the rest of my words be? What would your hand look like if this really happened? Have another song that fits today’s themes or that we should just check out in general? Tell us about it in the comments below! Hopefully you enjoyed the memes! I get a lot of these sent my way so if you enjoyed today’s format, I might bring it back again in the future so sound off in the comments below (No seriously, leave a comment)! Wow, I can’t believe that it’ll be June at the end of this week! Not that I don’t know how to read a calendar or something but you know, this year feels like it’s flying by! I still have a lot more that I want to accomplish in 2017 so now that we’re nearing the halfway mark, I’m going to have to take things to another level very soon! That reminds me, how are your New Year resolutions going? Did you stick with them? Before we go, a few quick updates. First, I’m almost unpacked from my last trip! …Almost. But hey, I started! If you’re a regular reader, you know that’s kind of a big deal! I normally take forever! Okay, you know the deal folks – please like, comment, share and tell your friends about this page! Also follow me on social media, especially if you enjoyed the memes! There are plenty more on my various pages so click those buttons on the side panel! Once again, thanks for dropping by. Hang in there, only 4 more days to go until it’s the weekend again! Until next time, May the Fork be with you! Next Post Darrell’s Epic Gym Fails! Hey! Love those memes!!!! I especially enjoyed so many of them!!!! Bring them back again soon so I can share them with my friends. Thanks for educating us on the difference between a meme and an emoji. Your Memorial Day tribute is “on-point”. I also say thanks to all. Keep on lol as your creative writing juices continue to flow in your blog posts. Hey, I’m glad that you liked the format! I’ll definitely have to do another round in the future. I agree, thanks to all who served and thank you for your comment! How about all of those meme??? They are super great!!!!!!. Your posts are always entertaining and informative and I want you to know that all of your readers really appreciate you for your hard work in entertaining us. Your experience with the toilet paper really “cracked me up.” Since I am short, I have stood on shelves in grocery stores many times, but after hearing about your experience, i think I will get help next time I need to reach something!!!! lol. I am sure that Batman stroller peeked the the thoughts of your mom…. Knowing that someday there might be a “little Darrell” lol……..
Ha yes, that toilet paper incident did not go so well! As for the little Darrell, hmm, I’m not so sure about that one…although that stroller is cool! Maybe they make an adult size? lol thanks for your comments! Pingback: Darrell’s Epic Gym Fails! – #DoubleFML FatDarrellPalooza! Pingback: Fantastic Voyage – #DoubleFML FatDarrellPalooza! Pingback: What Do You Meme? June 2017 – #DoubleFML FatDarrellPalooza! Pingback: Lost in the Matrix. There is no Spoon (but May the Fork be With You…) – #DoubleFML FatDarrellPalooza! Pingback: To Tree or Not To Tree: That is the Question – #DoubleFML FatDarrellPalooza!